Nia is an expressive body-mind-spirit movement program that offers an artistic and innovative approach to fitness and healing. Blending aspects of martial arts, dance arts, and healing arts, Nia provides a variety of movement dynamics to create an experience that is full-bodied, as well as full-spirited. The stillness and concentration of tai chi, the dynamic poses of yoga, the explosive power of martial arts, and the grace and spontaneity of modern and ethnic dance make it possible to create a whole new sense of well being! The use of eclectic, rich music, guided imagery, powerful kinesthetic cues, and heart-felt joy add to the full experience of a Nia class. This class is designed to work with your body's way and is for all levels and all ages, beginners are always welcome. Restorative flow and strengthening is available to EVERY BODY. This class will start with a short meditation and or a restorative posture designed to quiet the mind and slow the nervous system, reconnecting with oneself. We will flow slowly holding postures longer to cultivate alignment, strength, and integration. Each class will be intelligently sequenced leading to a peak posture designed to strengthen and challenge the body and mind. Class will end with a gentle restorative pose integrating body, mind and spirit encouraging harmony and balance on and off the mat. Gentle Nia blends the energies of the dance arts, martial arts and healing arts for a dynamic and fluid movement class designed to increase your life force energy. Gentle Nia uses music, imagery, and emotions to enhance your physical experience in class. Movements are designed in the Body's Way to improve mobility, flexibility, agility, strength and stability. We will be stimulating both sides of the brain and ideally creating new neural pathways leading to increased brain health. Gentle Nia can be done with or without shoes and if you would prefer to move from a seated position, chairs are available. No experience is necessary. This class is open to all fitness levels and drop ins are welcomed. No tu tu's or experience required! Does your work-out routine need a makeover? 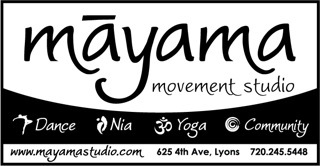 Mayama has created a high intensity, low impact class that focuses on sculpting and elongating muscles and getting your heart rate up. This class begins with a high cardio warm-up done to fun and motivating music to get your blood flowing. Students will then move to the ballet barre and be led through a series of exercises that are designed to trim, tighten and tone the body. Ballet barre fitness exercises use isometric strength training (holding your body still while you contract a specific set of muscles) combined with high reps of small range-of-motion movements. The class ends with a series of stretches that cool down the body. In this parent/child class, all the colors of your child will shine through joyful music making! We will sing, dance, explore musical instruments, and have spirited jam sessions. This will give your child the opportunity to fully express themselves in a nurturing environment and instill a love of music that will be with them throughout their lives. Creative movement is a class that focuses on movement quality, self-expression, and the love of dance as an art form while strengthening motor skills. Students will be introduced to dynamics, time, effort and spacing through imaginative and improvisational movement. Students will develop the ability to fully express themselves to music with not only creative dance exercises but with the aids of props like balloons, scarves, ribbons, sticks, hoops and small percussion instruments. Creative movement is the beginning step for building a passion for dance and music that will last a lifetime. and musicality. Students will begin to absorb positions, fundamental movements, and rich terminology. and steps to progress to further levels of dance. Recognized as the foundation form for studio dance, Ballet emphasizes technique, discipline, musicality and vocabulary. Created in the royal courts of Europe, Ballet values precision, alignment, and discipline. Our ballet classes will be conducted in a professional atmosphere by educated and trained instructors with teaching and performing experience. Students will master the fundamentals of classical ballet that will enrich their artistry as well as build a strong base for additional dance forms. Jazz dance is an American form that emerged from and combined African, Folk, Ballet, Modern, and Musical Theatre techniques in light of the Jazz music era. It is a dance genre that relies on rhythmical variation, flexibility, and strength. Students will be taught a variety of modern jazz dance styles that will emphasize rhythm, center control of the body, isolations, and balance. All which are skills that aid in the execution of the strong and sharp movements that make this form so popular. A fundamental technique, Tap dancing is an art form that combines percussion with movement. Rooted in African dance and blossomed by American jazz dancers of the 1920’s and 30’s, Tap is embedded in intricate footwork that focuses on complex rhythms. Students will master the codified steps that are used in rhythm and Broadway styles. The most recent and most popular form of movement is the American born culture and lifestyle of Hip Hop. An Art form that encompasses music, lyrics, art, and dance, Hip Hop is a technique that began in the seventies on both sides of the U.S. coasts. Its steps have been studied, mastered, and passed along influencing social and theatrical dance style variations. Students will be exposed to the intricate steps as well as the cultural aspects of the form. This class focuses on both hip hop foundation and choreography. Students will learn movement vocabulary from hip hop styles like breakin, locking, popping and choreography which combines these styes with hip hop and RnB inspired movement and music. Using this vocabulary and choreography each student will find their personal groove. This class emphasizes the fusion of traditional studio techniques (ballet, modern and jazz) as well as concepts from hip-hop, folk dance and dance from pop culture. Elements of ballet technique, modern floorwork and jazz isolations are incorporated into both the warm up and choreographic phrases. Students are encouraged to focus on individual artistry through the rhythm, focus, and movement quality that comes from the blending of different dance styles. Because a general understanding of multiple styles is required, this class is recommended only for dancers ages 12 and up who have had a minimum of two years of dance in at least two different dance techniques. Lyrical is a fusion of ballet, jazz, and modern, with expressive motions that tell a story. This class blends the sustained, controlled movement of ballet with the freedom, power, and dynamics of jazz and modern. Students will learn lyrical technique along with freedom of expression and interpretation of music. Breakin' is the original form of hip hop dance. In this class students will learn the basics of breakin: Top Rock, Footwork, Drops or Go-downs, Freezes and Power Moves as well as practice the foundation of breakin. The main focus of this class is to teach foundation and freestyle. This is a dynamic class with many acrobatic tricks and moves. Defined Motion is a group of Mayama students that dance together and compete in dance competitions as well as perform locally. Musical Theater Sing! Act! Dance! Sing! Act! Dance! In Music Theatre Workshop we will explore these various art forms that together make the Broadway musical so thrilling. Music theatre vocal technique, song interpretation, dance, and staged movement will be explored. There will be opportunities for both solo and/or ensemble singing culminating in a staged musical number. Work of this kind can help develop confidence and stage presence in young dancers and singers. Students in this class will have 1.5 hours total each week. Class will begin with 1/2 hour of singing and acting with Shannon Johnson followed by Musical Theatre Dance with Ali Kishiyama. Musical Theatre Dance will focus on learning proper dance technique while exploring the various dance styles used in Broadway shows. Class curriculum is based on ballet technique layered with Broadway style jazz movement and includes a proper warm-up, stretches, isolations, across-the-floor progressions, and combinations. Emphasis will also be placed on learning performance skills such as connecting with the audience and telling a story through dance and facial expressions. In this 12 hour camp, we will develop a piece that explores mental health amongst teens, particularly anxiety and depression. The subject of this camp has been selected by students as an opportunity to use music and movement to express subject matter that is relevant to them. We will guide them to listen, learn and express themselves through movement. In the end, we will have a piece that will be guided by us, but choreographed by the students. The students have selected the subject, will select the music and will choreograph the number. We will help them dive into the emotion utilizing space, timing, and expression to ideally bring out artistry in each student. We will workshop how to dive deep into emotion to truly captivate an audience. Team requirement this June is to attend a total of 8 classes (4 in Barre Body) & (4 in Turns & Leaps). Each dancer must attend a minimum of 8 classes in June. However, this price allows each dancer to attend as many of these classes as they desire-an unlimited pass. We suggest they come as much as their schedule allows. Join Jasmine for a fun-filled movement class where we will dive into Nia's movement forms: Dance Arts, Martial Arts, & Healing Arts. The intent of this class is to have fun with a focus on getting to know ourselves through movement. We will move for 45-50 minutes each class and have 10-15 minutes of discussion time. This class is for anyone middle-school aged. All levels are welcomed. Drop-ins $15 or register for the session.